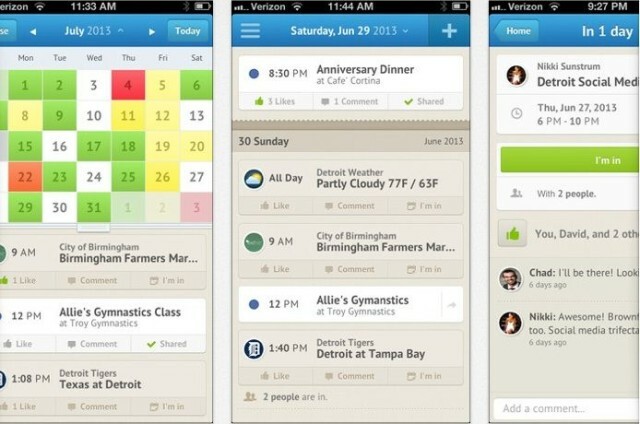 UpTo might be the best social calendar app ever made. I’ve never really seen anything like it; so if it isn’t the best (or really the only) social calendar app around, whatever else is out there must be perfect — because UpTo is pretty damn fantastic. The whole point of UpTo is to create a social experience around calendars, in a way that’s at once instantly recognizable and ridiculously simple to use. If you want to see what your friend have planned for the future, simply follow them on UpTo and all their events will show up on your calendar. You can add friends from Facebook, or follow people on your contacts list. The interface itself is attractive, and has useful little touches like a heatmap feature that color-codes days by how busy they are; the more events, the hotter the color. But wait, it gets much better. Because UpTo have made it easy to publish calendars from their web-based portal, all kinds of organizations have added calendars. I’ve followed calendars related to star-gazing events, music festivals, TechCrunch and of course, bicycle racing. There’s a lot there; and if you don’t see a calendar related to your activity of choice, you can always make one that others can follow. The app has just been updated with new features too: swipe away events that you don’t want to share, the heatmap mentioned earlier, the ability to share events with non-users and an attendance feature so you can see how many UpTo users are planning on attending any particular. About the only bummer is that there’s no iPad version.